This morning I walked through my house, trying not to see things. I tried not to see the underwear packaging left on the floor by my two teenage boys. The clothes my daughter left on the bathroom floor. The cereal bowl on the counter of a few floating Honey Nut Cheerios. Note, though I left them there, I asked my children to pick them up. Which means first identifying who left it out; usually there are a total of four “not me”’s. Then I had to make sure they followed through. That takes a lot more time than if I just whisked them up myself and actually deposited them where they belong, which is not a guarantee with child help. Not-seeing is a challenge for me because, while I am not the Queen of Clean as my mother is, I still don’t really dream of underwear packaging on the floor. I prefer my spaces relatively tidy and Cheerio-free. And like that whole “broken windows” theory? The more things aren’t picked up, the more people seem to leave their junk around. So there’s that. More than that, my kids’ clutter, for some reason, feels like sticky notes all. Over. The house. They are written to me. They read something like, In case you missed it, you’re doing a really bad job at raising responsible adults. Forget world-changers! Your kids don’t even see mess. Let alone PICK IT UP. But a funny thing happens at my house: When I clean up after my kids, they don’t actually get any better at it. I work hard to care for my kids. I want my home to be a prepared place where my kids are nurtured and happy. I want to launch my kids into life from a place where they gather unseen resources from tangible surroundings. I pack lunches on school mornings and make a hot breakfast–not because I believe that’s a woman’s job, but because I believe we care for the people we love, no matter what gender we are. It’s also important to me to live a life poured out, where I’m dying to myself. I believe the greatest in God’s kingdom is the one who serves all (Mark 9:35). Parenthood is constant exercise in setting aside my own selfishness, which is far more stealthy than I’d like to admit. But when do I cross the line from empowering my kids to enabling them? And is there a chance I might actually be creating needs for me to meet…to make myself feel better? I occasionally find myself doing nonsensical things–like making waffles and bacon an hour before I was to leave on an international trip–to assure myself I was not costing my family a thing in leaving. In fact, in a way that drives my husband a little nuts, I’ll even create ways for me to help others so I’ll be needed. Sometimes my ideas of a good mom and a good home can stand in the way of raising even better kids. Once at a family gathering, I saw a four-year-old niece–the same age as my son at the time– shimmy onto the kitchen counter, select a bowl, and proceed to make herself a meal. She had a single parent, so was used to being more independent. Part of my heart hurt a little for the girl–used to taking care of herself at 4. And the other part of me thought, I’m not sure my son could do that. But it’s interesting to know he can. I’ve seen it around the world, too: kids hauling water, making dinner. My point: What if our kids are capable of more? See, when our kids start doing things for themselves, they get a consistent message: I can do this. 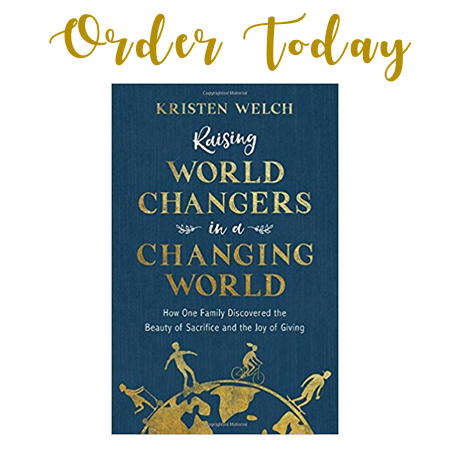 And part raising world changers is raising kids like Jesus, who “came not to be served but to serve, and to give his life…for many” (Matthew 20:28). I wrote a version of this in Sharpie on an index card and hung it on the fridge for awhile: Train your eyes to see what needs to be done, and your heart to do something about it. If my kids don’t learn to see what needs to be done, they tend not to do it, either. Does this action really love my kids–in the sense of doing what’s best for them? Or does it just make them feel good, and do what they’d want? Would my children benefit more from learning to do this themselves? I am I training kids who are used to being served, or to serving? Lately I’ve been practicing a little word when my kids tend to ask me to do things that they are actually quite capable of doing themselves. I say it kindly. But I still say it. “No.” And though I still sacrifice for them in ways they clearly see, I’m launching them in a new way: Showing them what they can, and should, do themselves. Love this and need the reminder! Thank you! This is so timely and perfect! Thanks! in your life? Absolutely, but WITH Jesus you can go to Him and ask for strength, courage, and godly wisdom. I wish back then i would of known about the word ENABLE. I thought by doing for them was just my way of showing them how much i cared/loved them. What i found out was that all i was doing was making them ‘not see’ that they need to do things for themselves. I was actually making them WEAKER not stronger. NOR did they appreciate it… they come to expect it. What a HARD lesson I had to learn. Only by the Lord opening my eyes to what i was doing did i see what i was doing. My mistakes has defitnely taken its toll. As they got out on their own they discovered other people were not going to ‘pick up’ and cater to them like they were used to. Angela, I loved this. Even as I struggle with this in my own home, I want to remember that I’m causing them to “not see”. Great words. Thank you so much for this! It’s just what I needed to read this morning. I feel like we’ve been stuck in a rut lately with me doing all of the serving and in doing so, getting burned out and having a bad attitude. It’s time for me to challenge my kids to be more like Jesus and start stepping up to think of others first. I’m so thankful Jesus is such a perfect example and our household would truly benefit if we all imitated Him more! I am the mother of a recovering addict who is 37 years old. whatever you do don’t do what your child is capable of doing. Believe in them, and tell them every day how capable they are. Tell them you believe in them and then empower them to do what they are capable of doing. Do not lift one finger to do something that they are capable of doing themselves.